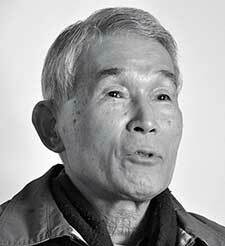 “When the A-Bomb fell on Nagasaki, August 9, 1945, I was 6 years old and living there with my family in a typical Japanese-style wooden frame house with sliding interior partitions (shoji) and exterior glass windows. Normally on a hot summer day I would go to the mountain with friends of my age to catch dragon flies and cicadas. However, on this day I was playing at home. Nearby my mother was preparing the mid-day meal. Suddenly, at precisely 11:02, we were blinded by an intense light like 1,000 simultaneous flashes of lightening. My mother pushed me to the ground and covered me with her body. We heard the roar of a great wind and flying debris of the house collapsed on top of us. Then there was silence. “Our house was 2.5 km. (1.5 miles) from the epicenter. My sister who was in another part of the house was cut by flying splinters of glass. A playmate who went to the mountain that day was exposed to the great blast of heat caused by the detonation of the bomb. His body was badly burned and he died a few days later. My father was recruited to help clean up the destruction in the center of Nagasaki. At the time we didn’t know about the dangers of radiation that would later cause his death. “The A-Bomb had turned the center of Nagasaki into an inferno of death and devastation. Communications and transportation were disrupted. There was no food in the city and we were starving. One week after the explosion we walked through the rubble of the city center where fires still burned on our way to the countryside where relatives would share what little food they had. Some years later I worked in the Nagasaki Atomic Bomb Hospital. It was very painful to see the survivors still suffering from the effects of burns and radiation.